Could this be a case of an incredible shrinking monument? Has it sunk into the ground more than previously thought? No, not even close, said the chief scientist at the National Geodetic Survey. The survey conducted the measurement with accuracy to within one millimeter. Modern international standards come from the Council of Tall Buildings and Urban Habitat. It determines an official guideline for building measurements. They call for a different base point than what was likely used in the 1880s. So said Dru Smith, chief geodesist with the National Geodetic Survey. The standard measures from the lowest open-air pedestrian entrance to the building. The only observable height change was the pyramid-shaped tip. It had been rounded off over time. Surveyors in 1934 also noticed the peak had been rounded. They believed it was due to frequent lightning strikes. The strikes had melted the aluminum tip. "We were able to determine about 3/8 of an inch had been melted off from the very top," Smith said. That means the original 1884 measurement, completed with much less sophisticated equipment, was within 3/4 of an inch of the findings from the newest survey. It used the original brass markers as a base point. The monument was completed in 1884. It was the world's tallest structure until 1889. That's when the Eiffel Tower was built. It remains by far the tallest structure in the nation's capital. The city strictly restricts building heights. Most buildings are shorter than the U.S. Capitol dome, which rises 288 feet. The new survey was conducted while the monument was wrapped in scaffolding. The restoration work is being done because of a 2011 earthquake. The monument was built on land that used to be underwater. It has sunk about 2.2 inches since 1901. I cant belive that they thaught the washington monumet was shrinking. It is 556 feet high! It is now 10 inches shorter. Mather Luther King Jr spoke their. It Is in Washington D.C. It is a cool place to. There were many changes that effected the official height of the monument. According to the text, in 1934 surveyors said that they thought the once pointed top of the monument was now rounded. These people say that lightning strikes hit the monument and disintegrated the metal rod meant to stop the lightning. In paragraph 7, official Smith said, " The building didn't change height because of anything. It is just where you start from." In the text, it states that after the monument was built a plaza was soon created. That means the ground height changed. That means that the monument might not have shrunk at all! Many events caused the Washington Monument's official height to change. One main reason that the monument has lost its height, is because of the frequent lightning strikes. The lightning strikes are the reason that the pyramid-shaped tip is more rounded now. According to the text, "The strikes have melted the aluminum tip." Chief geodesist, Dru Smith, said, "We were able to determine about 3/8 of and inch has been melted off from the very top." Dru Smith also thinks that the difference in height could have been from using a different base point, or that the ground level changed. The text states, "They call for a different base point then what was likely used in the 1880's," and "It's possible the markers were at ground level in the past. A new plaza was installed around the monument more recently." The last main event that caused the monument to shrink was a earthquake. In 2011, an earthquake had caused the monument to shrink "about 2.2 inches," because it was built on land that used to be underwater. Even though the Washington Monument is shrinking, its significance will not shrink with it. I didn't know this. Did u? Do u like the Washington monument? Ms.Clarkson, this was very interesting because I got to learn about the Washington Monument and how it changed over time. I like this very much because it gives specific details about how the Monument has shrunk . It also had math in it so I love it VERY MUCH!!!!!!!!!!! 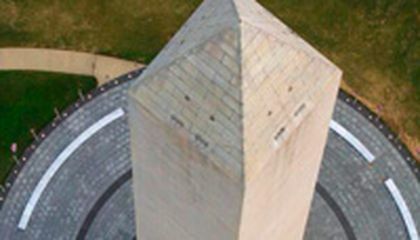 In my opinion, I think that its very interesting that the monument "shrunk" as they say, but what I think they should have done is told the public what had happened to the monument. This was a VERY interesting story to read. Id definitely like to read more! 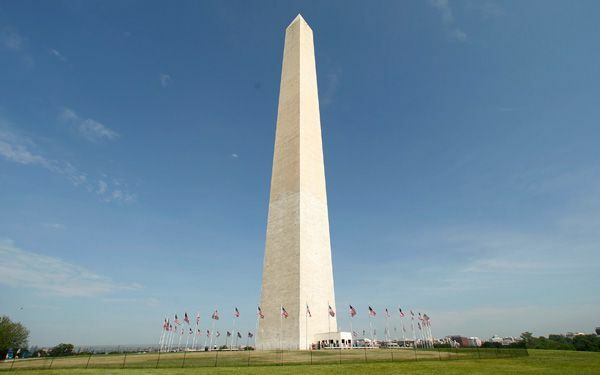 Government surveyors have figured out the height of the Washington Monument. It has decreased almost 10 inches in 130 years. This monument represents the first nations presidents.